Once again, "Economics 10a: Principles of Economics" is the most popular fall course among Harvard undergraduates. Keeping in line with last fall’s enrollment numbers, Ec10 edged out Computer Science 50: “Introduction to Computer Science I” as the College's most sought-after class. According to data released by the Faculty of Arts and Sciences registrar’s office, Ec10a’s 627 undergraduate enrollment surpassed CS50’s 606 undergraduates by 21 students. Last year, the margin was far more narrow; only 6 more students enrolled in Ec10a than CS50. But in terms of total enrollment, CS50 remains a more popular course than Ec10a. Including graduate students, non-degree students, cross-registered students, visiting undergraduates, and Harvard employees, 697 are currently enrolled in the College’s flagship Computer Science course. Meanwhile, 633 are enrolled in Ec10a. CS50 rolled out a number of changes this year. By default, the course is now graded on a satisfactory/unsatisfactory basis by default, and Harvard administrators and CS50 instructors have repeatedly stressed the importance of academic integrity in lectures so far this semester. More than 60 students in the course last year faced academic dishonesty charges. The College’s third largest course is the perennially popular Statistics 110: “Introduction to Probability,” with 524 undergraduate enrollees. Shortly following in enrollment numbers are Ethical Reasoning 18: “Classical Chinese Ethical and Political Reasoning” and Science of Living Systems 20: “Psychological Science” with 508 and 443 undergraduate enrollees, respectively. Statistics professor Joseph K. Blitzstein, who teaches Stat110, attributed the course’s popularity to what he described as a growing recognition of the importance of probability. East Asian Languages and Civilizations professor Michael J. Puett, who teaches ER18, said he believes the General Education course is so popular because it encourages students to confront “big” philosophical questions. 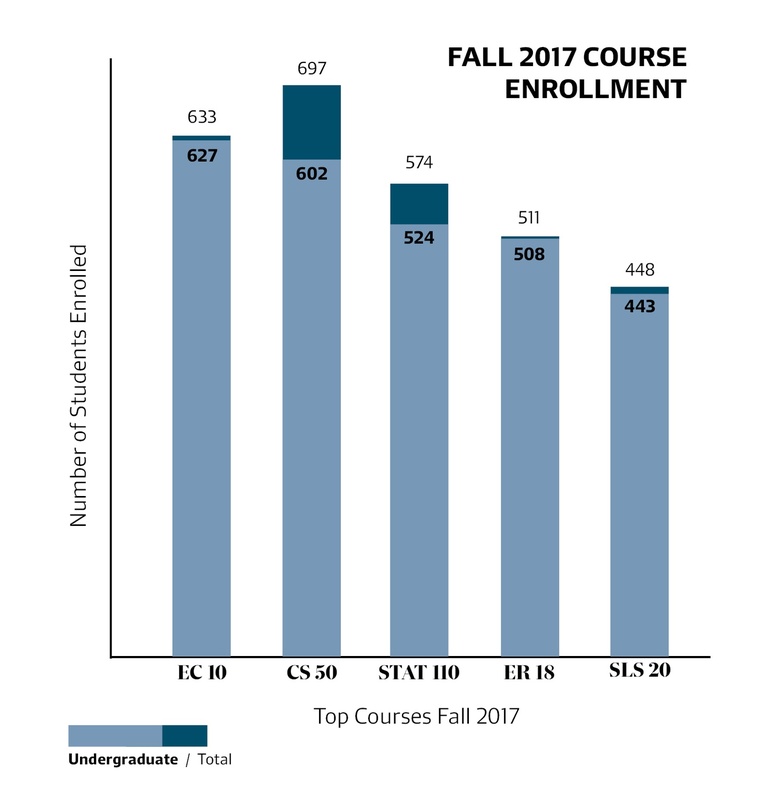 Science of Living Systems 20: Psychological Science saw a huge leap in an enrollment this semester, with 376 more enrollees this semester than in the spring. The course is taught in the Fall semester by Psychology professor Daniel Gilbert, who said that he could not explain why the course’s enrollment was particularly high this term. “Professors regard enrollment like weather, we just take it as it comes,” he said.